বেংক কেশ্বিয়াৰ্ - পইচা নাই ! 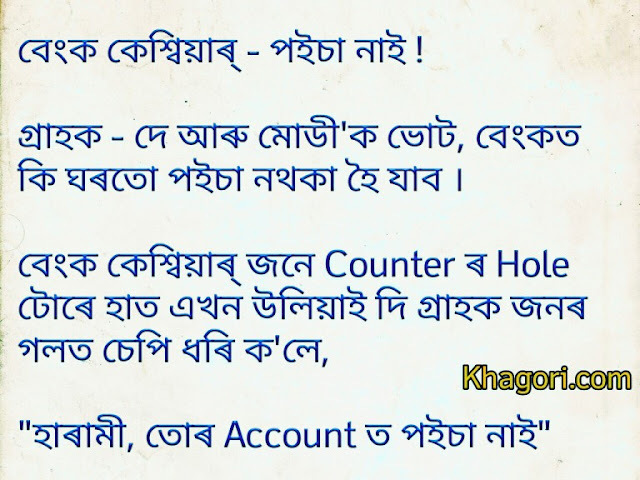 "হাৰামী, তোৰ Account ত পইচা নাই"
Bank Cahier - Poisa Naai ! Customer - Modi'k vote de aaru, Bank ot ki ghoroto poisa nothoka hoi jabo. "Harami, tur account ot poisa naai"
যেনে পইটাচোৰা এটা দেখিলে, উ মাঁ ! আৰু যদি এটা বাঘ আহি যায়, আই ঔ, বাপ্ ৰে বাপ্ ! Dear Maa' khoru khoru problem ot kamot ahe. Dear Deuta' dangor dangor problem ot kamot ahe. Jene cockroach eta dekhile, Uii Maa. Aary jodi eta tiger aahi jay, Ou, Baap Re Baap ! বেমাৰ - নেজডালত খজুৱতি ! Veterinary Hospital or eta problem. Eyat register book ot naam malikor likha hoy aaru bemar jontu'r. Husband aaru wife divorce or babe court loi gol. Judge - Tumalokor 3 ta lora suwali nijor majot kenekoi bhogai loba ? Husband aaru wife ye bahu khomoy sinta korar pisot decision lole je khihot duyuye aaru eta khontan jonmo dibo aaru tetiyaloike ekeloge thakibo. Jokes tu etiyao khekh howa nai. Karon, After 9 Months, Khihotor twin bachaa he jonmo hol. 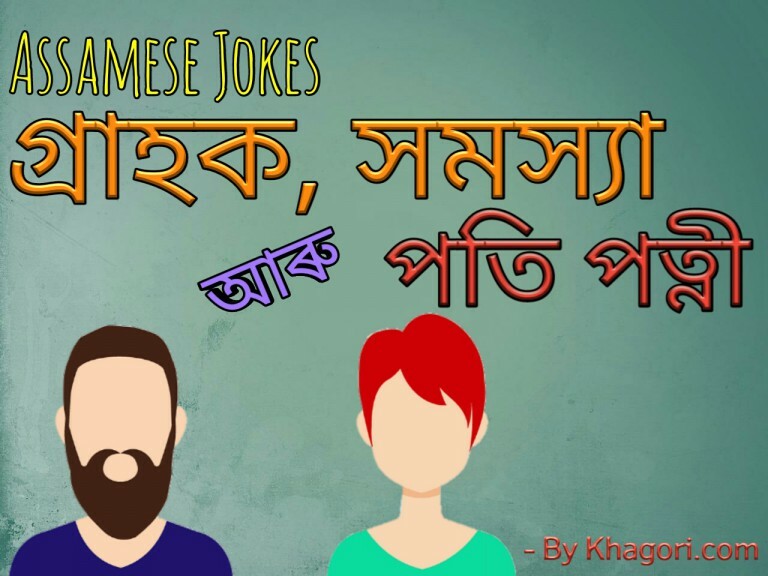 Viewers, Do you like these "2018 Jokes In Assamese". Kindly expess your thought to our comment section just below to the post. 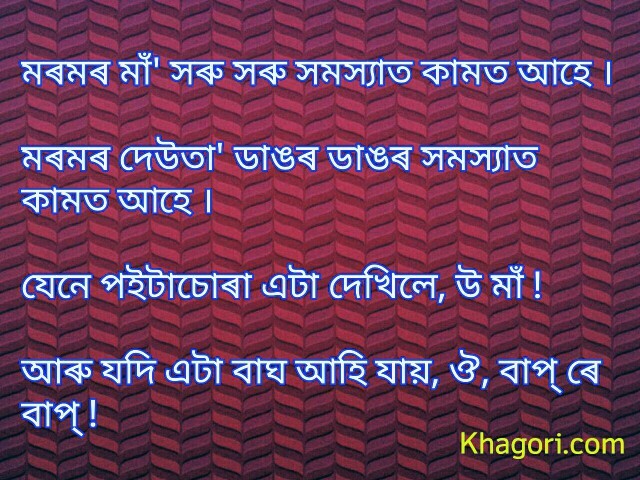 I always try to publish some selected standard Assamese Jokes. These are the best jokes ever in Assamese only for you viewers. Please Like and Share the post. Your support makes me motivated to do so. I am trying to do the best only for you viewers. Thanks keep visit.